Montevideo is the capital of the Repœblica Oriental del Uruguay and has a population of about 1.292.000. 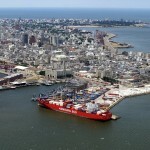 It is the center of the country´s commercial activity and by far its largest port. Uruguay has no heavy industry being concerned largely with farming, tourism and fishing. In 2011 cargo handled was as follows: Containers: 5.096.000 tons (cargo only); general cargo 821.000 tons; bulk cargoes 2.974.000 tons. 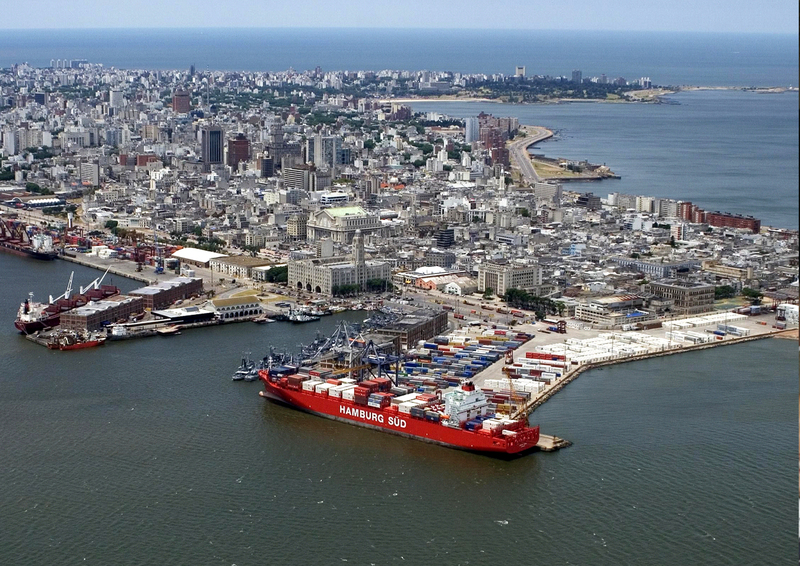 Montevideo is under the Free Port system, as set forth in the 1992 Law 16246 and subsequent regulatory decrees. 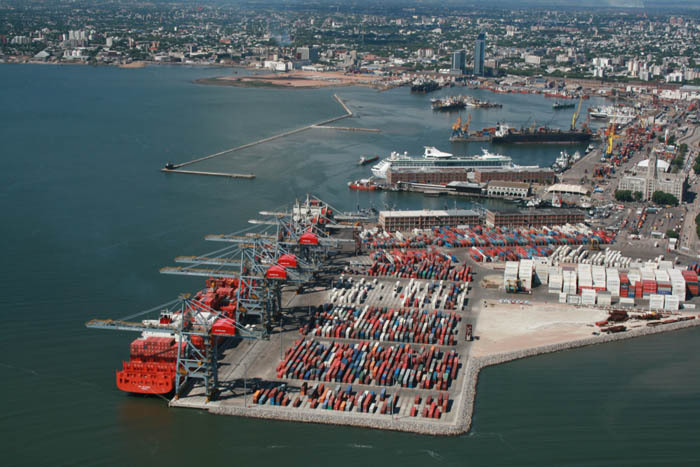 There are various plans to expand ports facilities, including new quay “C” and “D”, Puerto Capurro Fishers Terminal, bulk terminal, and a new container terminal, all of this inside Montevideo harbour. 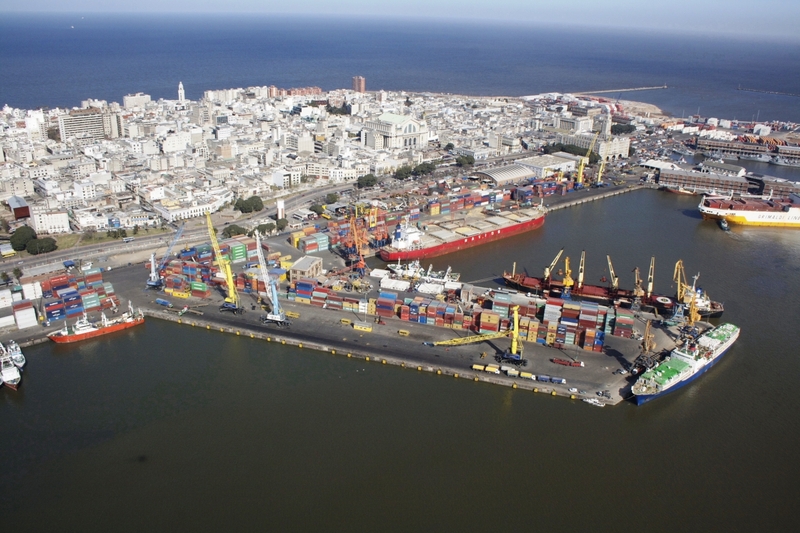 There are also plans for a new logistic port at Puntas de Sayago, abt 4 kilometers west of Montevideo entrance, with a regasification terminal (under studies). Access channel dredged to 12 meters (see below). The Anteport is to the North of the entrance, between the breakwaters. The eastern breakwater projecting from Punta Sarandí is 900 m long and the western breakwater lying at right angles to the eastern one is 1300 m long. The passage between the two breakwaters is 320 m wide. The anchoring zone in the anteport requires dredging, and there is not room for more than five vessels. Where there are no buoys, it is usual to make a running moor. There are 4 mooring buoys in the anteport, to which vessels moor stern on to transship cargo, F.G. reefer vessels receive frozen fish in transshipment here, with fishing vessels lying on either side of the on-carrying vessel. Whilst in port, the use of ship´s boats either for crew or passengers is not allowed, and their use for training or for painting, etc., must be approved by the port authorities. Ship´s gangway must be illuminate at night. Use of tugs to anchor or leave anchorage at the anteport only, is not obligatory. The maximum speed in the anteport is 6 knots, and 8 knots in the entrance channel, reduced to 4 knots inside the basins. The port is on the south side of the Montevideo Bay. In addition to the anteport breakwaters, it is protected by the inner breakwaters known as Dique de Cintura and Espigón “F”. The Dique de Cintura, length 1335 m, runs parallel to the south side of Basins 1 and 2 before curving NE to leave an access between itself and Espigón “F” which projects outwards from the eastern side of the port beyond quay Nº6. Opposite quays A and B, two arms from the Dique de Cintura breakwater extend at right angles towards the quays, leaving a passageway of 150 m into the basins. The port has 3 basins, 2 for ocean-going vessels and one for river traffic, these basins being formed by 1) the coastal/river quay and quay “A”(coastal/river basin), 2) quays “A” and “B” (Basin Nº 1) and 3) quay “B” and eastern side of the port (Basin Nº 2 -coastal berth). There are 14 berths in the port, apart from the 2 petroleum berths at La Teja, north of the bay. Except in the basin reserved for river craft, a safe draught in the port is 10 m. At 10,30 m draught, ships may lie aground, the bottom being soft mud, as in all ports in the Plate. All depths are referred to chart datum. At container terminal depth are 10,5 to 11 m; will be dredged to 14 m in the western side (see below Muelle de Escala pierhead). After entering the Anteport, the docks lie to the East, and piers and basins are here described from west to east. South of a line joining Punta Brava to Punta Yeguas. The inner roadstead is delimited by the mentioned line and the line between 34º 51´S / 56º 14´W and 34º 53´8S / 56º 14´8W. Normally, the outer anchorage used is 1 n.mile east of the fairway buoy (km 9,350). The Roads of Montevideo consist of the Outer Roads situated to the South of the bay and the Inner Roads situated outside the western breakwater. Both anchorages are exposed, and vessels are recommended to enter the Anteport, for which pilotage is required. a) Not to drop anchor at less than 900 meters (4,8 cables) from the nearest lighted buoy in the entrance channel to the Anteport, or within the same distance from the breakwaters, nor anchor in the area bounded by latitudes 35º 00´00´´ and 35º 15´00´´S, and longitudes 55º 56´30´´ and 56º 00´00´´W, where there are telegraph cables. b) To hoist and fly the “B” flag of the International Code in a visible position during the day and to show a red light during the night, in those cases where gunpowder, or explosive or inflammables materials are carried. The Coastguard in such cases will fix, within the zone between the channel and the Cerro coast, the anchoring ground for discharging operations. c) To fly flag “L” of the International Code, in those cases as established by the aforesaid Code. d) To fly flag “Q” of the International Code in a conspicuous position until the Port Health Authorities have visited the ship, unless free pratique has been asked for by radio. NOTE: In those cases where the provisions of rule “c” arise, the Coastguard will choose the place of anchorage. Access channel 12 m. Basin I and II, 10 m at datum. Port closed by Coastguard under following conditions. a) When wind force exceeds 60 km/h (32,4 knots). If wind force is not above 70 km/h (37,8 knots), in special circumstances and with confirmation of Master and pilot that an ocean-going vessel is in condition to proceed, then departure or entrance may be authorized by Coastguard (PNN). For yachts, launches, motor boats, etc. port is closed if the wind force exceeds 50 km/h (27 knots). b) When visibility is less than 1000 m. If the visibility is more than 500 m, and the electronic aids are appropriate according to information from Master and pilot, then entrance or departure of ocean-going vessels may be authorized by Coastguard. Tugs, launches, barges, and other crafts used for port operations, can sail and/or enter in any weather condition, if visibility is not less than 200 m.
c) Speed within access channel must not exceed 8 knots. A distance of not less than 700 m is to be maintained between vessels when entering or sailing. The depth is 12 m at datum. Vessels waiting for a pilot should do so within 900 meters of the Fairway Buoy. Meeting in the channel is permitted for vessels under 9 m draft or for a vessel drawing over 9 m meeting with a vessel drawing less than 7,50 m. There is a cross current, changing direction with wind and tide, of about 1,0 knot. The eastern section of the channel should not be used for anchoring, as there are submarine cables. West of the channel, between the buoys and the “Calpean Star” wreck: depth is 7,39 m for 500 meters. Ships entering from the West, land their Argentine pilot at Montevideo but, if continuing on to sea without entering, drop the pilot at position 56º 00´ S / 35º W, where launche takes him to Buceo Yatch Port. 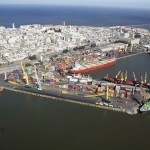 Vessels are allocated a berth or buoys in the port of Montevideo, previously assigned by the National Port Administration, according to their order of arrival or priority. VHF: call and safety Ch#16; weather forecast, notices to mariners and warning (storms, fog, port closed) Ch#15; information and control of the area Ch #13; Coastguard Control Center Ch#11; tugs, pilots, bridge to bridge Ch#12; watch Ch#16, alternatives Ch#11 and 13. See general section. Pilots embark/disembark at outer roads, 180 deg/5´ off breakwater, Lat 34º 59´8S Long 56º 13´4W. 1 tug of 4000 HP; 1 tug of 2500 HP, 1 tug of 3200 HP, 1 tug of 3500 HP, 1 tug of 3000 HP and 3 tugs between 450/850 HP. Must be requested to Montevideo, who will send a non-exclusive surveyor. See “Time Table” on “Complementary CD”. 24 hrs around the clock, 365 days. Attention and treatment at all levels and specialities can be obtained from a wide variety of Private/Public Hospitals and Clinics. About 18 hotels of various categories, available all year round. Carrasco airport 19km away. International and domestic air services. Regular ferry services. (“Sea cat” 2 h 45 m Buenos Aires/Montevideo) to/from Buenos Aires. Highways #1, 5, 26 and Panamerican highway, connected with all Uruguayan towns and with Argentina via two international bridges. Railroad (goods only) connected by railroad to Argentina, Bolivia, Brazil and Paraguay. Railroad into the port area connected with Argentina, Bolivia, Paraguay and Brazil for cargoes in/out and transit, however seldom used. Tides can be influenced considerably by wind. Available. Service is under the control of the Coastguard (PNN) authorization, there are two private companies and 1 Navy Divers). Normally between 1,005 and 1,010 LW, and between 1,015 and 1,020 HW. Compass and RDF adjusters may be obtained at any time. The lack of heavy traffic and relatively deep water provide favorable conditions for these operations. 1 x 200 ton. This has an auxiliary hook for 32 ton, displacement 1500 MT, draft between 2,25 m and 3 m, can load up to 400 MT on deck and 200 MT at hook, operates with wind force up to 72 km/h (39 knots). 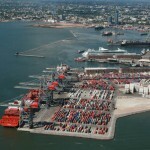 Vessels berthed within port can hire mobile cranes (for general cargo or container) at Muelle de Escala. (TCP private terminal). Berths have fixed fenders. Hire included in wharfage dues. Paraguay and Bolivia, cargoes are stowed in several private warehouses in Second Zone within Port premises, under Free Port facilities. Dischargeable to trucks, rate about u$s 65 per trip from Monday to Friday and U$S 98 Sundays/holidays. Summer SW plus allowance for density of water (see above). The Coordination Center of Search and Rescue keeps watch H24 on 500 KHz A1, 2182 KHz A3, 2638 KHz A3 and 4000 KHz A3, and on request by VHF. Uruguayan Navy, National Naval Prefecture, Uruguayan Air Force, National Port Administration, Radio Amateurs Federation, ANCAP, Port Pilots Association, etc. have co-partnership in the operations, by means of personnel, ships, planes, radio, etc. The Search and Rescue Navy Vessel ROU “Vanguardia” is utilized for this purpose. The vessel is suitable for deep sea towage, and has a team of divers onboard. See TCP (Muelle de Escala) and Montecom (Basin 1&2) descripted above. There is one dredger assigned to the port. Available, for inflatable life rafts, CO2 batteries, fire extinguishers, smoke detectors, Sprinklers, etc. Hull, deck, engine, auxiliaries, electrical, electronic and radio repairs can be carried out, including underwater repairs. Service is requested by Port Pilots and nominated by the Agent. Three motor launches are available. Available in any quantity, including those articles under Customs privilege as per decree 847/86 (for foreign flag vessels only). 1754 available at TCP (Muelle de Escala) and 100 at TCM (Montecon). Disposable to tank trucks. Can be arranged.